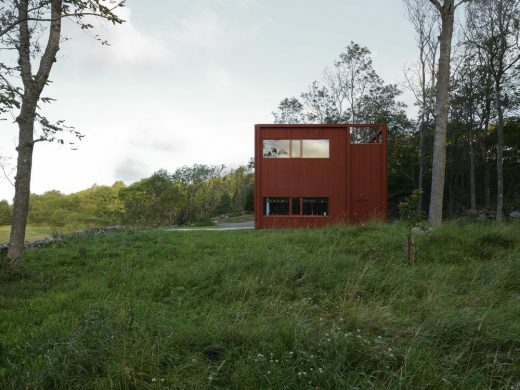 House for a drummer is built for a single father of two with great interests in music, sailing and nature. 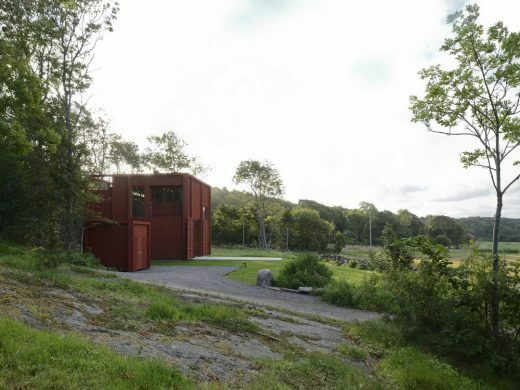 The house is located half an hour north of Gothenburg on the Swedish west coast at the edge of a vast farmland. 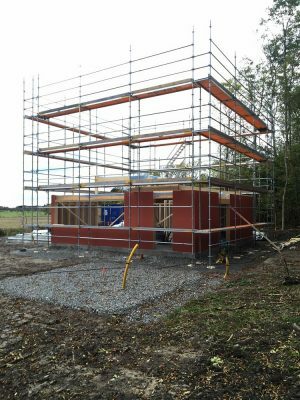 The opening of the facade to the ground level is 3.5 meters high and is provided with magazine doors for sun and wind protection. 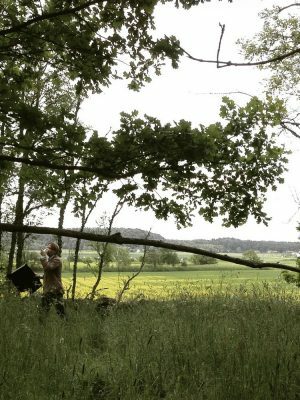 The location of the building between the fields and forest. The torque of the interior in the upward motion is reflected in the facade expression. 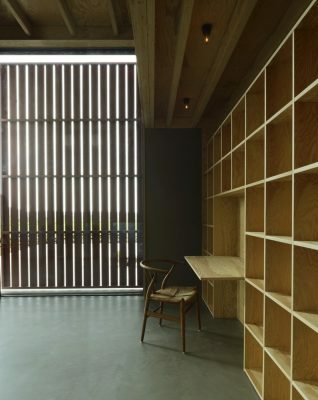 The context has some very specific historic legacy as an old farm stall and warehouse used to rest on the site. It burned down some generations ago and was never rebuilt but has influenced the design. 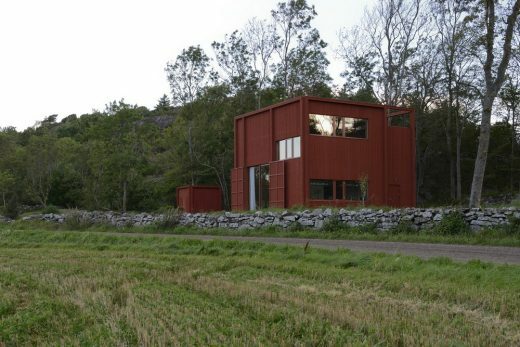 The new house is a straightforward warehouse inspired volume with a distinct framing and with large barnyard doors covering the windows facing west, all painted in traditional Swedish Falu-Red colour. The client, a single father of two, wanted an open and social two-story house. 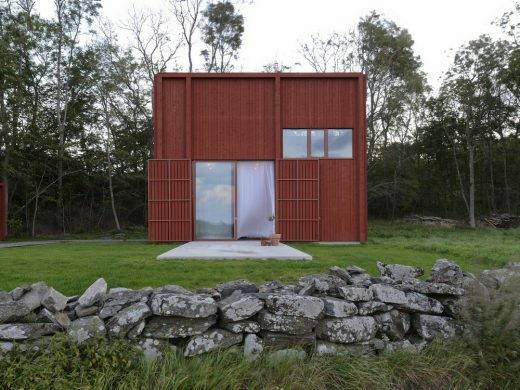 He wanted a house that could blend in and become a part of the site and its surroundings but also had a spatial richness of its own. Entrance to the northwest. The building is sectioned vertically similar to magazine buildings in the surrounding area. Here they have been given a function as the downpipes of the building is hidden in the pillars. 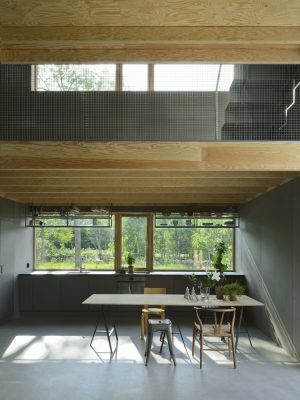 The movement through the house ends with an evening sun balcony that overlooks the entrance hall. 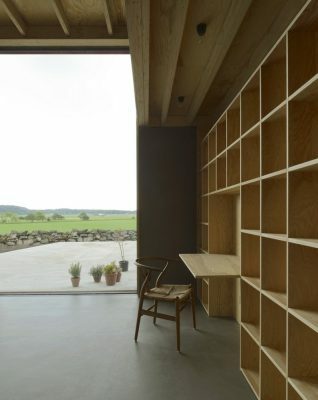 Entrance hall overlooking the countryside in the south. 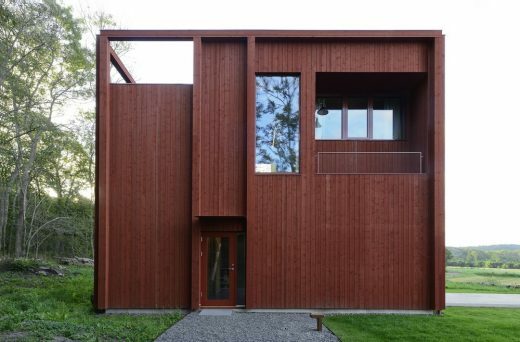 The façade is treated with a lighter version of Falu red colour. Plate details around windows, rails and screen ceilings are treated with the same color scale. 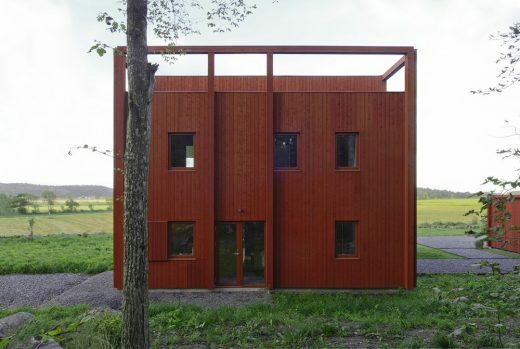 The bearing concept of the design is an open section through the house. Just like the open plan it allows the rooms to intertwine between the two floors. Interior view from guest room to staircase and kitchen. The staircase is made of pine with a sliding rack attached to the catch. The roof with visible solid wood construction and walls of grey coloured wood fibreboards. The floor is glossy and dust-bound concrete floor. Kitchen and furnishings are made of gray wood fiberboard. Over the entire kitchen counter there is an oblong window section that emits light through a roof-mounted kitchen shelf in steel and glass. In the background a glimpse of the cubbyhole/reading corner. 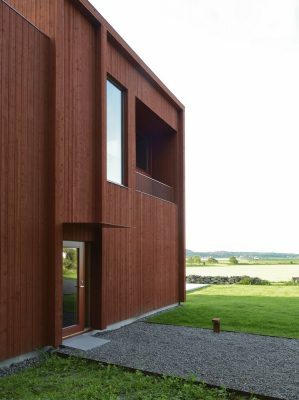 The ground floor has a concrete floor that seamlessly continuous on the outside while the other floors have varying heights and formats. Kitchens and upper living room with slab ceilings. Light slides diagonally throughout the entire building. Living room’s north side with a built-in bookcase and glass opening to the wide open landscape. Floors of glossy concrete, plywood walls and gray wood fiber boards (type Valchromat), floor tiles and solid plywood furnishings. 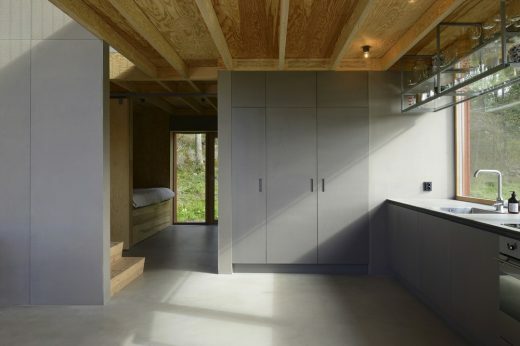 Without losing living space the floor slab is displaced vertically to create contact between the floors and allow light to spread deeply down the diagonal through the house. The north side of the living room with a built-in bookcase and glass opening to the wideopen landscape. The 3.5 meter high glass section can be sealed by sparse magazine ports that sow the sunlight and stops gusts through the sliding glass door. In addition to the entrance hall, WC, kitchen and living room, the ground floor also includes a passageway with a niche designed as a daybed. 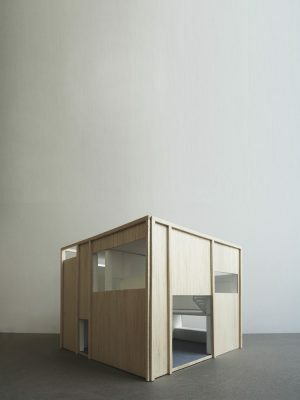 The space works as a cubbyhole for the children or as an additional more secluded reading and relaxing area that is separated from the open and integrated living room. Second floor living room with its offset slab and transparency. A rolled powder coated sheet staircase leads to the building’s highest placed space. The highest placed window dipped down diagonally throughout the entire building. 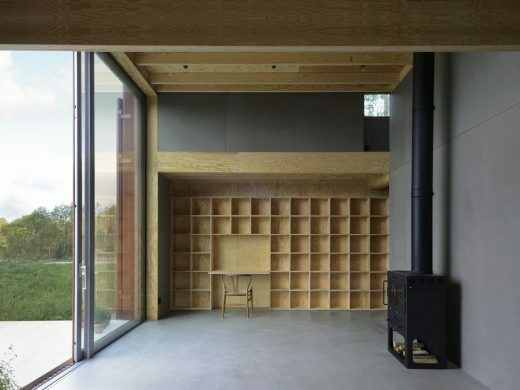 In the living room there is a place-built bookshelf in plywood with the house’s workplace. 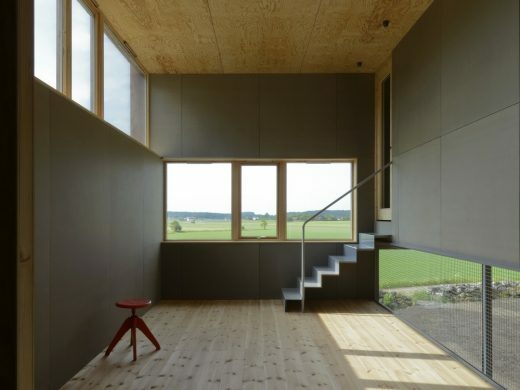 Plywood is on of two materials that define the house. 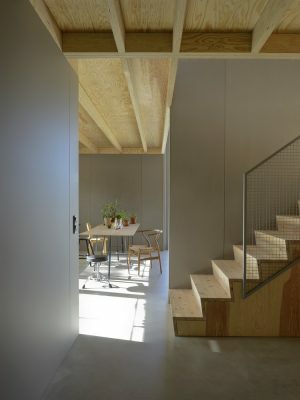 The ceiling, the parts with exposed beams, place-built furniture, some walls and the stairs are all made out of wood. The other surfaces and the entire kitchen is decorated with a dark grey wooden fibreboard (Valchromat). A staircase from the kitchen reaches the second floor. A tall vertically oriented room redirects the spatial flow to the upper part of the living room and to a balcony overlooking the west. The upward spiral finally ends in the master bedroom that virtually hoovers over the living room. Photo of the presentation model. 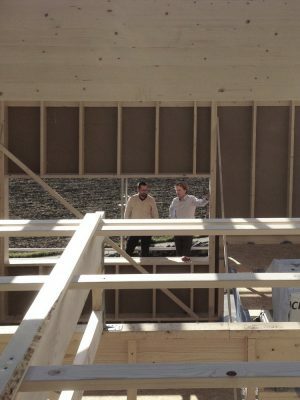 Visit on site in the early stages of the project.